It was another day of Guitarmonk Tune Time Season # 2 video shoot. We started our day before dawn and the shooting of another song of GM Tune Time season 2 ‘Unforgettable Bollywood’. The song was ‘Neele Neele ambar se’, one of the most complex and popular tunes of Bollywood for guitarist. The set was designed as very calm, informal with elegant sofa sets and paintings at the backdrop. Set courtesy and sponsorship by Must Arts Galleria. Today we also called our local drum expert Mr. Bal who look alike famous singer Mr. Kailash Kher. He is a jolly natured, professional musician and was very punctual. 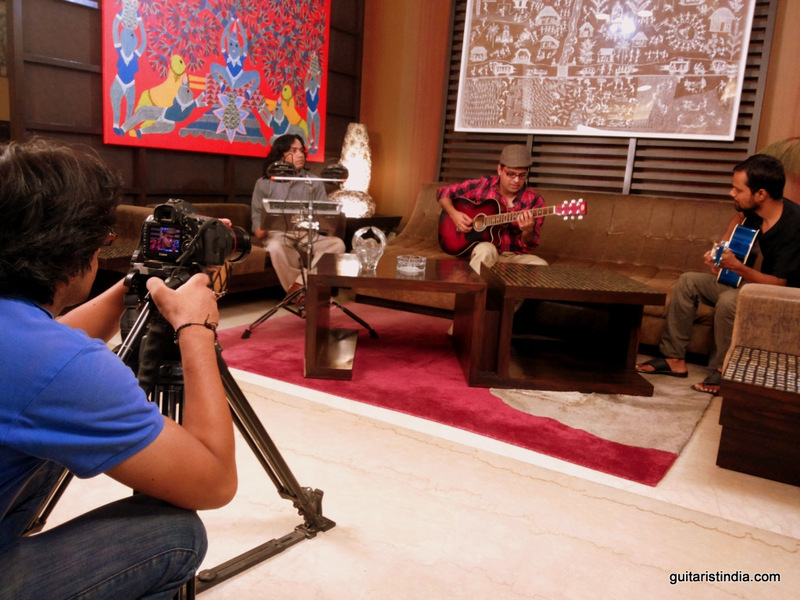 Rhythm Guitar and Bass Guitar is taken by Gaurav and Ashwin. DOP Mr. Brajesh with his cameraman and light team arranged the set up very fast and very professionally. Look forward to having another shoot this week. Times of India or Times of Real Estate?